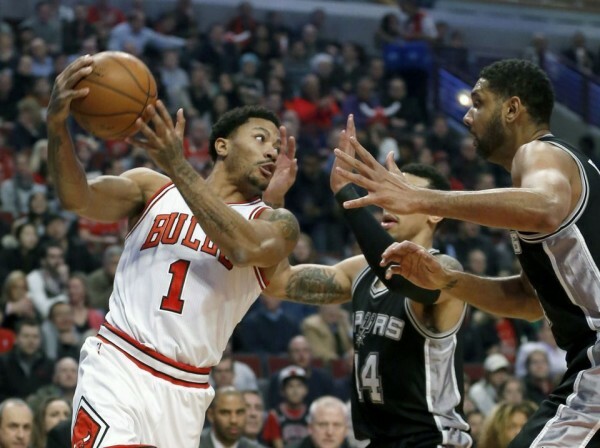 It’s difficult measuring leadership or even spotting it, but Derrick Rose calling out his teammates and then leading them with an excellent game to a 104-81 win over the San Antonio Spurs is the perfect example of what a vocal leader needs to be. Derrick Rose was vocal before the game and after it. About how the slide of six losses in eight games had nothing to do with injuries or his head coach. It was all about the players not putting up the kind of effort this team is known for. It certainly looked like his words trickled down and fell on the right ears, because the Bulls tore the Spurs apart in a win that can change the direction of a season, especially when he was on the floor. The Bulls were fantastic during his 27 minutes, finishing with a +26, his highest since a February 2012 win over the Hornets. It wasn’t just the +/-; the Bull scored more points per play (1.16 to 0.90) and were better from the field (51.1% to 41.4%) during Rose’s time on the court. He himself finished the game scoring 22 points on 9-of-16 from the field, adding five assists. He is averaging 24.8 points and 6.4 assists while shooting 48.9% from the field over the last five games. Rose was aggressive and stayed away from jump shots and mid range jumpers, looking like the guy everyone wants him to be; the ‘old’ Rose, which attacked the rim at will and seemed to make easy baskets each time he got into the paint. Out of his 22 points, 14 came came in the paint, almost double his season average. Eight of those points came on drives to the basket, and the Bulls overall scored 11 points when Rose drove to the basket. This wasn’t just an offense win, with Jimmy Butler scoring 17 points (7-7 from the line), 15 for Taj Gibson and 15 from Aaron Brooks coming off the bench. They held the Spurs to just 37% from the field, and hardly allowed any open shots to the Spurs, contesting 26 of the 34 jumps shots. Of those contested shots, the Spurs made only 7. Two things the Spurs do extremely well: Catch-and-shoot and corner 3’s were taken away from them; they made only 3-of-13 on catch & shoot 3-pointers while hitting only 22.2% of their corner 3-pointers, as the Bulls rarely missed assignments on defense or let the ball movement confuse them. All this resulted in their biggest win over the Spurs since 1997, when a Jordan-Pippen combination led to a 111-69 win over a team that was already tanking its way to getting the number one overall draft pick in the upcoming draft, which turned out to be Tim Duncan, and changed the fate of the franchise. The Spurs have now lost 17 games through the first 44 of the season. They lost an average of 22 over the last two years, and have finished winning more than 70% of their games four years in a row. The Bulls now hope that their slide has stopped. This might have been an out of the ordinary game, but the energy and effort Rose talked about where there right from the start. Until Joakim Noah comes back from his injury (again), they’ll just have to keep up this level of energy and focus, especially on defense, as the gap between them and other Eastern contenders has grown a bit too much over the last couple of weeks.